Along with natural beauty and vibrant food, Southeast Asia is particularly well known throughout the world for its shopping malls and sprawling markets. Here are five of the best, most exciting markets in the region. Bangkok’s enormous Chatuchak Weekend Market is one of the city’s biggest draws and attracts a crowd of both locals and tourists. 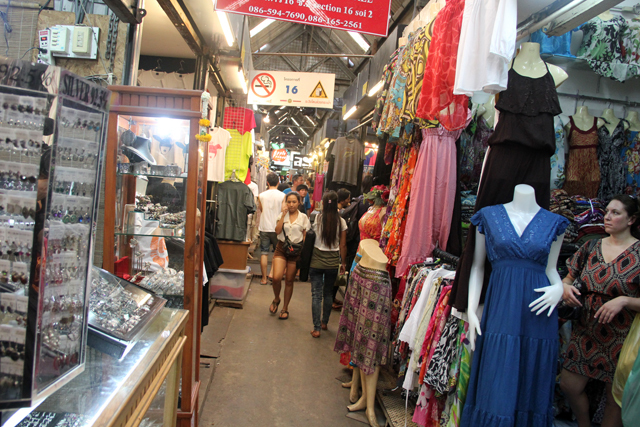 The market consists of around 15,000 individual sellers ranging from permanent stalls and stores to roaming carts. Though nicely organized and set up with section names and stall numbers, it can still be a challenge to navigate the narrow shopping alleys without getting lost a few times. As an open air market in Bangkok, you can be assured no matter what weekend day you choose to visit, Chatuchak will be hot. Be sure to drink lots of water and get a refreshing and healthy bottle of pennywort juice known as nam bai bua bok. Vietnam is one of the most energetic countries in the entire world – busyness is an understatement. Hanoi’s biggest central food distribution market is known as Long Bien Market. 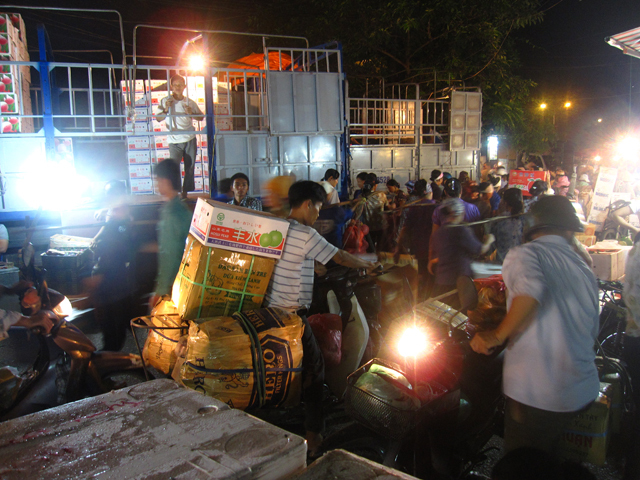 Everyday in the early morning hours, the market is alive and booming with customers, transportation and delivery vehicles. The huge quantity of fresh produce, giant piles of herbs, tons of vegetables, and tropical fruit cover the market and sprawl onto the adjacent streets. I had an incredible time standing out-of-the-way on the side near the entrance of the market while gazing at the ridiculous amount of motorcycles and double basket porters scurrying back and forth. Laos, on a whole, is probably the most laid back, quiet, and relaxing country in all of Southeast Asia. With a much smaller population than neighboring countries like Vietnam and Thailand, Laos remains less affected by industrialization and generally more rural. The Luang Prabang Night Market, which sets up each evening at about 5 pm, brings together a crowd of vendors, many of whom are from the surrounding countryside. The market is not exactly exciting busy like the other markets on this list, but more exciting for the cool selection of crafts, traditional clothing, and art. Some of the most popular items to purchase are the colorful Laos style shoulder bags and purses. Also the Hmong Food Market, located on the far side of the night market, is a great place to grab an authentic Laos meal. Indonesia’s Tomohon Market, on the island of Sulawesi, is one of the most interesting markets in Southeast Asia. If you can handle the exotic animals on display, you’ll discover some truly unique things and probably gasp at a few things too. Local Sulawesis are known throughout Indonesia as being rather adventurous when it comes to delicacies. Rats, monkeys, dogs, snakes, sloths and bats are a frequent sight when at Tomohon. Keep an open mind and enjoy the excitement! 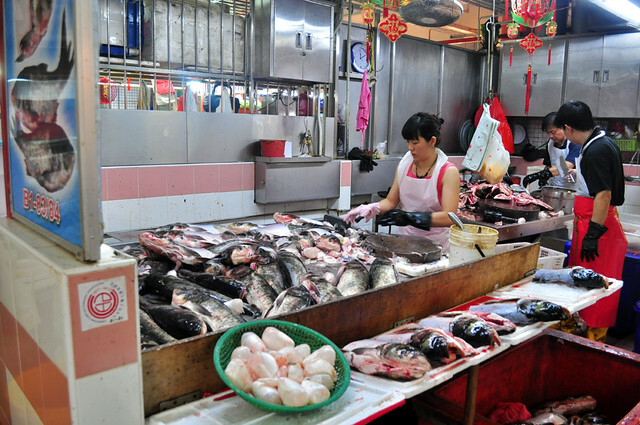 Rated as one of the top fresh food markets in the world, Singapore’s Kreta Ayer Wet Market is the place to go if you want to see where the food you’re eating comes from. Every ingredient you need to cook local Singaporean specialties is available somewhere in the market, including a selection of exotic and imported goods as well. Though huge and packed with food, Kreta Ayer is well maintained and quite a bit cleaner than some of the other food markets in Southeast Asia. When you’re tired of browsing fresh ingredients, head upstairs to grab a bite at the hawker food court. In Southeast Asia everywhere you go or look you'll find markets along the street, hidden in the alleys, or sprawling indoors. Since markets are where life happens, they are not only great places to shop, but also great places to browse and observe the local culture. I really like the market at Luang Prabang. Like Laos itself, it’s very laid-back, no hassle and charming. The market in Sulawesi looks an interesting one, so definitely a place to visit if I make it over there. My favourite in Thailand though is the Sunday Walking Street Market in Chiang Mai; great food and a lovely atmosphere. Yes, i agree with what you said about the Kreta Ayer Wet Market, as i stay within close range away from the market and is rather cheap price to get the fresh goods in downtown Singapore. But Tiong Bahru Market is better and more popular with their food, so popular that people from neighboring countries such as Malaysia (especially from Johore) and Indonesia (especially from Batam) go to the market and eat the food as frequent as every weekend without fail, rain or shine. But i like the neighborhood dry market better. I totally agree about the market in Luang Prabang. The people there do not hassle you and just let your browse as you please, unlike other markets I experienced in SE Asia. I highly recommend this one. Been to two of those…but this is the first I’ve heard of the one in Sulawesi…that’s sounds really cool, it’s got some wild foods. Great post! I love wandering around the markets in Asia. There is always something interesting to see, particularly at the fresh food markets. Heading to SE Asia in a couple weeks starting with Vietnam, and cannot wait for the markets! The markets were so cool in SE Asia. Definitely a fun part of the trip.